You might as well know the above phrase as ” face your biggest challenge first”, finish with it, don’t overthink it ..easy to say, right? Picture yourself ready with your brush in front of that flawless white canvas but you are afraid to draw the first line to put the first drop of color on it as if it is an insult. I felt like that for years, and sometimes I still feel like that when it comes to expressing an idea and more so to publishing it. Here I am now, the first month of the year checking my new journal, ready to tick off one project after another and I decided to start with this personal blog, so we can get to know each other. When I started my company, I knew that Definitely Greece will not be a faceless corporation. 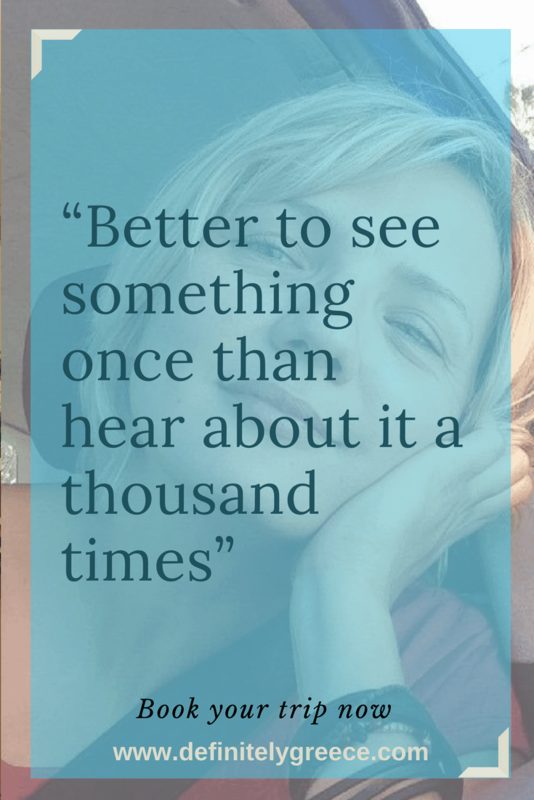 I wanted this space to be where visitors can find a lot of extra information about Greece, be inspired to visit, relax their eyes with the warm blues and crisp whites of the Aegean or the lush green landscapes of our mountains. I have since realized that it is also important to write about the who we are, who I am and what we offer. It does not come naturally, this urge to talk about oneself. But I see why it is needed. You are after all going to be travelling with us! So, I am Efi and this is my website. 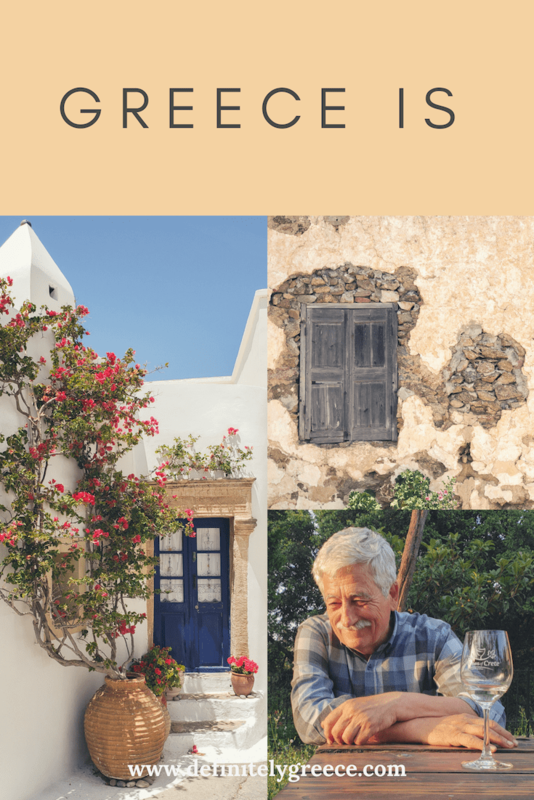 Its aim is to encapsulate a little bit of Greece. The photos you find here are the result of my personal artistic struggle with photography and the work of a multitude of talented photographers, including dear friend Marios Dadoudis. 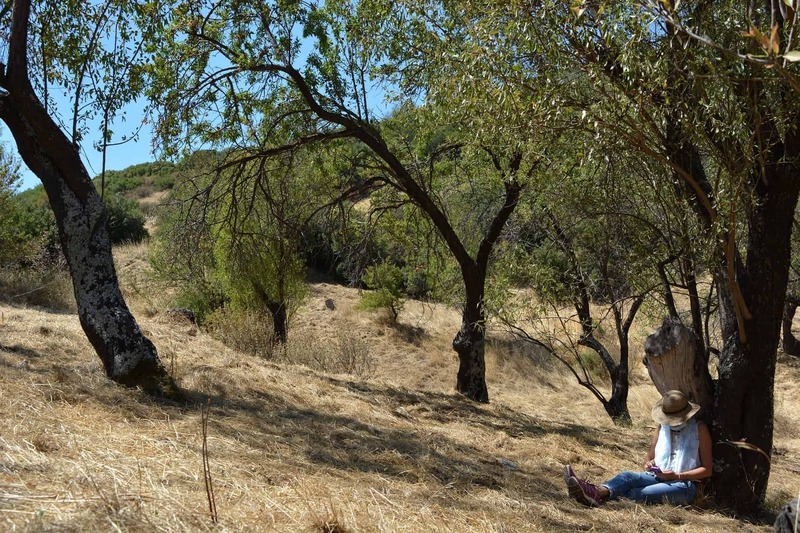 The written information is compiled and researched by a team of passionate Greek colleagues, including Delphi child Maria Dimou who loves discussing music, dance and philosophy and Rania Kalogirou, who recently launched her own travel stories website and believes in the power of people working together and words above all else. The faces that plan behind the scenes, organize accommodation, plan alternative routes and welcome you to our country are many. Trust is one of the strongest currencies to have as a team and we are glad to have Nelly Kontaxi as our client services manager. You can find more about our team on our Instagram page, or just here at Meet Our Team. 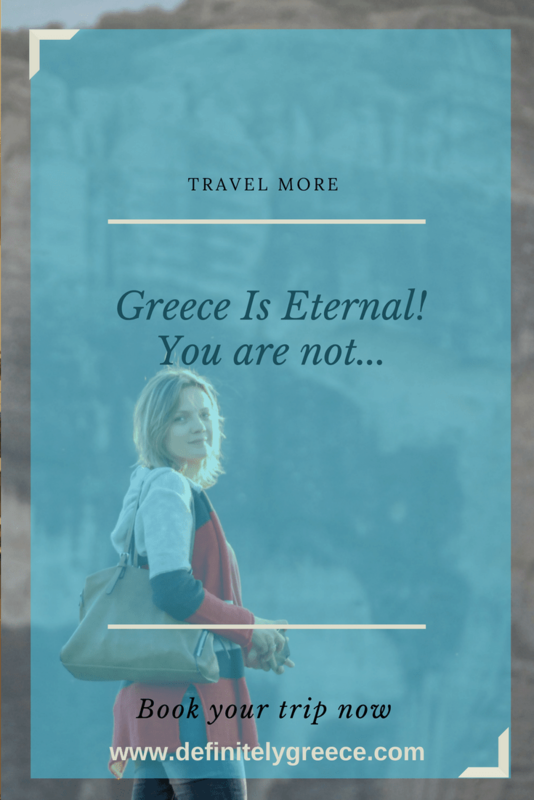 My love for my country and the enthusiastic responses I received from friends every time I suggested destinations and planned their itineraries to Greece, led to this company. Yes, so simple. I needed my country and others needed to see it. In some regards, this is my dream job. The one I never knew I wanted until it presented itself to me. The igniting force was passion and enthusiasm, I don’t know what that tells you. I hope that it shows that it isn’t money driven; that now and for as long as I can, I will be creating trips to Greece. So, the story about the brand is simple, but actually, this story is about YOU! No matter where you are coming from I want you to know that I am thinking a lot about you. Yes, you, my future guest as we like to call our clients. I know how that sounds, trust me. Like I said earlier, at some point in our life we need to speak the truth, our truth. I understand that I sound romantic, sentimental and many times my words are lacking those fancy complicated expressions. But remember that English is my second language and believe it or not a few years ago I could stay hours in front of an email before I send it so that I was sure that my message was clear. If you have made it that far I want you to know that I respect you. 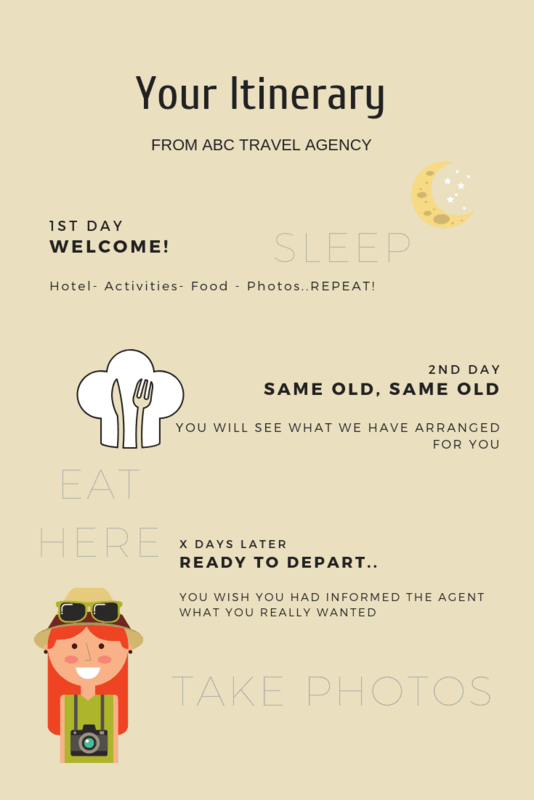 This is the reason I want you to know more about me and I hope that this post will help those who hesitate to share with us a bit more about themselves because what we really want is to design the best possible itinerary for you. My view of olive trees and a spot of blue sea, growing up. Well, you probably noticed that the word includes my name, Little did I know when I chose that name years ago while I was driving from Taupo to Napier in New Zealand that this company will not only cover Greece. Well, slowly but with the same passion and under the same philosophy we have started covering trips outside of Greece. Soon to be announced so stay tuned. Now you may read more about our team but let’s focus on some details regarding our brand and our mission. First of all, we don’t have headquarters, yet! But we are very passionate about Greece and we take our job seriously especially when we talk about hospitality. Our ”office” is everywhere we believe you will have the best experience and we are constantly trying to match the perfect destination with each one of you. That is why we want you to communicate with us through a video call in the starting planning stages of the trip and this is one of the reasons why we don’t post our itineraries. Personally speaking, Greece is not just in my heart. The land of philosophy, myths, gods and warriors, mountains and sea coursed through my veins with every beat of my heart. Like another Odysseus, my passion for my homeland grew year after year as I followed my husband on his own international coaching expedition. Expat living, meant international schools which meant my four kids would miss out on knowledge about their country. So, we turned to home-schooling. Through my research about my country in order to pass this knowledge to my kids, I came to realize and appreciate my homeland more. Home-schooling my kids prepared me and brought me closer to Greece than ever before. So, my marriage is the why and 6 countries accounts for the where but neither explains how much! Only when I realized that many people from many lands knew bits and pieces about Greece, mostly from school lessons covering Greek mythology or worst from Hollywood depictions of Greek history or culture, only then I decided that this is it! I wanted people to experience MY Greece. Do you want to visit the popular touristic places, or would you prefer the not so known, without compromising a thing from your dream vacations? Let me tell you, I know and seek those places in Greece and those people who have the same philosophy as you and me. This is why we advertise the unknown Greece and for that reason, you will find many off the beaten track destinations on our website. And this is why you will see me suggesting you places to visit that only a few will choose. I shudder at the idea of tours that capitalize on popular depictions of Greece from movies and common misconceptions and yet never touch the soul of Greece. I want you to meet the locals, those who will not see you as a tourist and they will put in front of you authentic flavors and dishes to enjoy. Greece is not just Zorba the Greek, it is not just the country that you can break plates because you got excited, it is way more than that. Now, don’t take this wrong, Santorini and Mykonos are beautiful, amazing destinations and both islands are high up ranking as top destinations. But! Is it the right place for you? Maybe! I know that this is not for everyone which is absolutely fine! But I want to be clear that we don’t serve fast food experiences or copy paste itineraries. This is what Greece means to us, we don’t know about you but if you choose to travel with us let me tell you this last thing. Greece is so small but yet so big because of all the layers of history you need to scrape to understand, to respect and admire! ….Greece is the people and we want you to feel at home. Don’t miss out on the real Greece! What Is It Like Climbing The Tallest Mountain In Greece?